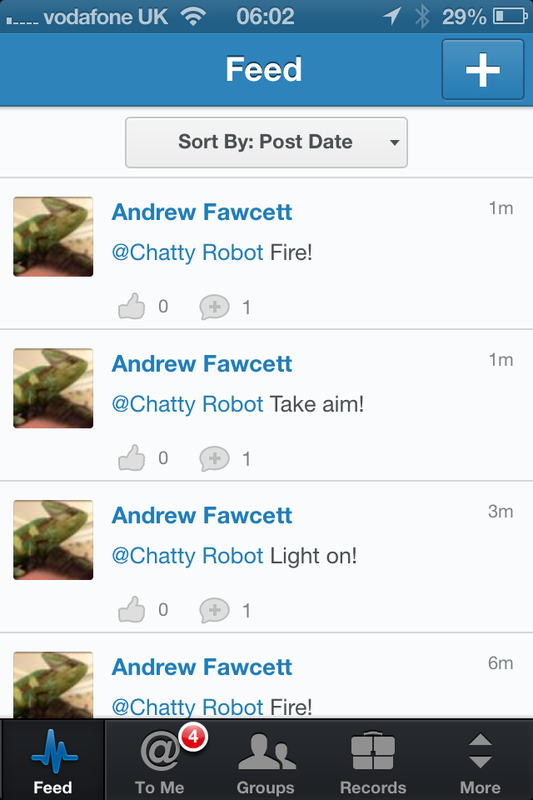 After a few late nights / mornings I finally got my second robot chatting with me via Salesforce Chatter! I chose to switch designs as it was easier to mount the Wifi sensor and move this robot around than the Alpha Rex. You cannot see it in the video but I was controlling it via the Chatter app on my iPhone, I took some screenshots after the video. The NXC code I developed for this communicates to Salesforce via a custom Heroku RESTful Service. Which provides two services /command and /chat that wrap the Chatter API in something easier to code against in NXC. I’ll share the Java code for these services in a later blog. In the meantime enjoy! Categories: Lego, Machine Cloud, NXC Programming, Robots, WifiBlock | Permalink. Think of the possibilities! 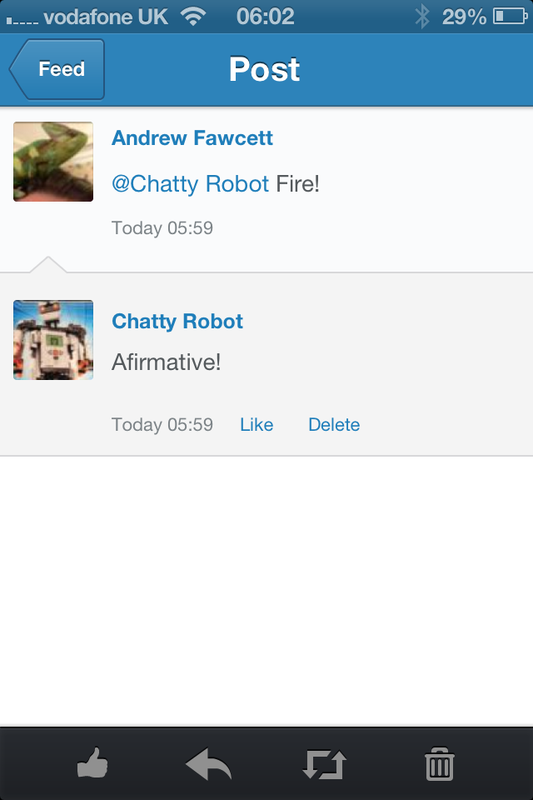 How about voice control via Chatter? Now thats a great idea, there are so many sensors for this thing the possibilities are only limited by ones imagination! I do plan plan to make it respond more to its environment as well and make Chatter posts to ask for help or decisions on what to do for example. I’ve had a similar idea for a while – having the sensors report back data to be stored in Salesforce, from which you could then do reporting and analytics. Great job! Unfortunately the WifiBlock firmware does not appear to support HTTPS, I’ve yet to confirm this though. In the meantime I wanted to get something hooked up. I actually tried to create something via Force.com Site’s but of course I cannot update Chatter Feeds from this context. However I didn’t know about this trick and will give it a go. I agree, would be nice to remove the Heroku aspect and go direct. Thanks!